It is already a week since we hosted our first ever event for Service Providers and it has just flown by. We were delighted that 53 people signed into the event, with a good proportion turning up when the doors opened, giving chance to browse around the stalls and help themselves to refreshments. We welcomed representation from many organisations, including Oswestry College; Abbey Care; Healthwatch Shropshire; Shropshire Seniors; Shropshire Clinical Commissioning Group; Terry Jones Solicitors; Help2Change (Shropshire Public Health); Terrence Higgins Trust; Telford & Wrekin Council; Healthwatch Telford & Wrekin; FRESh (Equalities Forum); Vicarage Nursing Home; LGBT Shrewsbury; Age UK Shropshire Telford & Wrekin; Veraty Care Solutions; Eternal Life Community Church; Aubrey Kirkham Funeral Directors; Manby Bowdler Solicitors; SIGNAL; Shropshire Partnership of Advice & Advocacy; Citizens Advice Shropshire; Alzheimers Society and NHS England. The event was Chaired by Sue Gorbing (changes and SAND) and we started the afternoon with an introduction to SAND and a bit of our story, presented by Action Group Members Heather Osborne (Age UK Shropshire Telford & Wrekin) and Kay Davies (Vicarage Care Home). Attendees heard how SAND started with a film …. Gen Silent and has gathered some, now familiar statistics about Shropshire* as well as some celebrity support! We incurred additional expenditure of £93.21 when we bought stamps and envelopes so that we could mail invitations to the event to every single residential care home in Shropshire. The cost of this has been mopped up from our own SAND-bank and all SAND Action Group members gave their time for free to prepare and deliver on the day (bearing in mind that many are unsalaried so it really is free). We also grabbed a few people to help out at the event which is starting a new foray into widening the circle of support and finding ways to involve others in the work that SAND is doing. We’d like to thank Sue H (video), Holly (photos and refreshments), Marinke (door), Ann (refreshments), Kathy (refreshments) & Geeta (refreshments). Feedback to date is extremely positive, people found the event interesting and enjoyable. SAND’s commitment to finding creative, engaging ways to convey messages seemed to pay off. There have been a few encouraging emails from attendees following the event, with intention to move things forward and we hope to translate these into meetings, conversation and action in the next few weeks – watch this space! As it happens the SAND Action Group is exchanging its June meeting for an Away Day so that feels quite timely! Oh and we are well chuffed that Clare Summerskill agreed to become a Named Supporter of SAND – joining Sandi Toksvig, Peter Tatchell, Bisi Alimi, Sue Sanders, Jane Traies, Tom Robinson and Carol-Ann Duffy. We like that a lot! * There are approximately 98,500 people over the age of 65 in Shropshire Telford & Wrekin and the percentage of older residents is growing 13% faster than the national average. 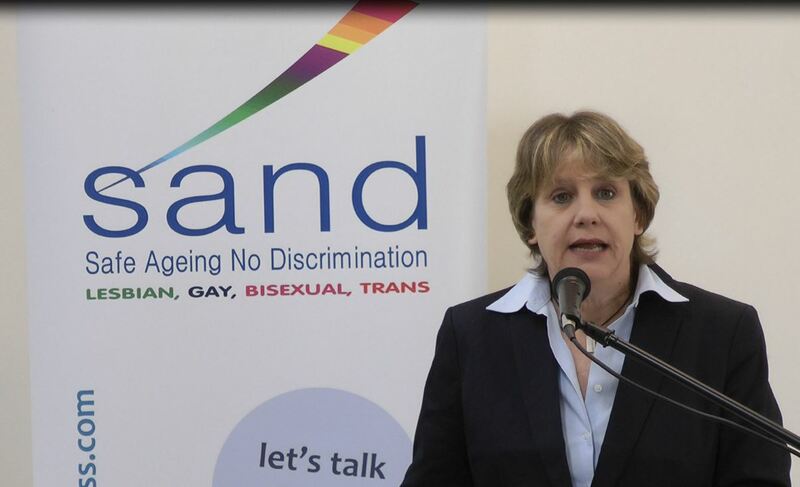 This suggests that there are likely to be about 6,000 lesbian & gay people over 65 (6% of the population, as endorsed as an estimate by the Treasury). Add the numbers of trans & bisexual people and this constitutes a conservative minimum. Taking the 6%, then the number of older and old people in nursing beds, sheltered housing, residential beds in Shropshire should be about 308 and SAND currently knows of 3.